of Surveillance in the Web 2.0 Environment," by Manuela Farinosi (pdf) (via E. Morozov on Twitter). This paper reports the findings from research into how Italian students conceive of social media and the sorts of metaphors they rely on to understand it. The "shop window" metaphor is prominent, according to the author, which fits my ideas about social media being primarily a space for a particular sort of self-display, which changes subjectivity. Its communicative logic is primarily based on showing something to other people’s gaze. Its transparency has the capacity to create relationships and put the inside in touch with the outside of the shop. Nowadays the shop-window’s logic is spreading and is reaching out to the whole of society and people are virtually forced to live in a showcase (Codeluppi, 2007). The window’s visibility involves living in the middle between the private and public dimension. Online profiles can be read as full-blown virtual shop-windows, as a tool of self-promotion. The visibility of the shop-window entails the exposition of what is personal and therefore to learn how to build and manage personal identity is becoming one of the essential steps in order to live in web 2.0 environments. This concept fits naturally with the metaphor of social media space as a theatrical stage. This feeling of being onstage becomes difficult to escape and eventually one is struck with the nagging feeling of having forgotten one's lines. No one gets to exit the stage, but must go on improvising. The author's main point is that these are not top-down modes of control being reflected in the metaphors; social media is not experienced as "panoptic." Instead there is "participatory surveillance," which mitigates spying or makes it much worse depending on how you interpret it. impacts of this continuous life sharing and the effects on offline life should not be underestimated, and it is necessary always keep in mind the possible risks associated with overexposure. I tend to think of "horizontal control" as a way of inducing us to spy on another to generate useful marketing data while making it excusable, acceptable. Participation disguises the emptying out of privacy. I have been reading a few papers lately about online social networking and surveillance. One of which, "Web 2.0, Prosumption, and Surveillance" by Christian Fuchs (pdf), was the impetus for the Arvidsson paper I wrote about before (a critique of Fuchs that I found convincing a priori). 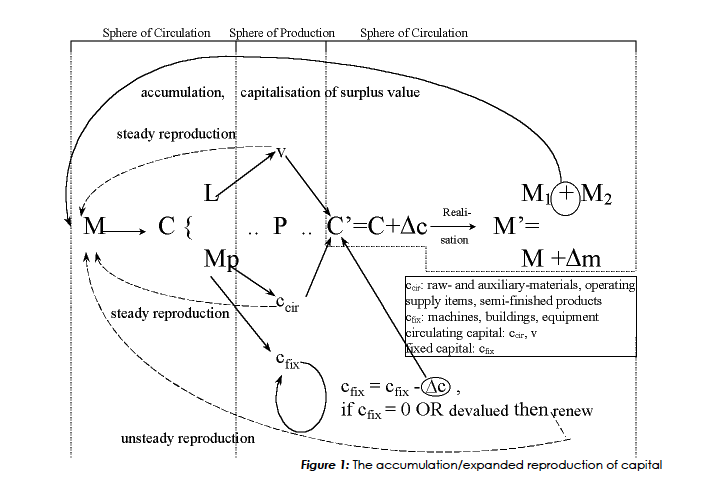 Fuchs's paper spends a great deal of space rehashing doctrinaire Marxist positions on the labor theory of value and includes one of the most confusing charts I have ever seen outside a Lacan text. The main things I took away from the paper was a useful tech-jargon phrase ("architecture of participation") and a tangential point about Marx's "critique of value" consisting in part of the forms value takes within a capitalist system. Ideology, practices, institutions, etc. combine to make value appear and become measurable only in certain ways, regardless of what the transcendental source of value qua value happens to be (which may ultimately be a theological question). You could read Marx as arguing that capitalism makes value appear only in commodity forms, which leads to the commercialization of everything, the subsumption of all forms of labor to capital, to the cash nexus absorbing and dictating more and more forms of human interaction. Value may be other than utility, but our social structure is such that we understand it mainly as a quantity to be maximized rather than, say, a condition or a set of harmonious and stable relations or whatever. It requires an increasing amount of active resistance on the part of individual subjects to think of value in alternative ways. This is ultimately an ideological rather than an economic point, though mainstream economics is a discourse that rationalizes and supports the ideology, enshrines it as essential common sense and an infallible guide to policy. It becomes difficult to think "validly" outside of economism. Fuchs also cites Mark Andrejevic's idea of the "digital enclosure" and his point about interactive technologies "generating feedback about the transactions themselves" -- which is to say the context and conditions of market practices are captured as a new kind of commodity even as the exchange is being facilitated. I find that extremely relevant but am still trying to figure out the arguments to express why. (Fuchs, alas, was not helpful on this front.) Technology becomes an engine for generating data about exchanges, which reshape the conditions of exchange themselves and the underlying social values embedded there. They change the bases of markets and the expectations market actors have about fairness, timeliness, credit, exploitation, boundaries to what can be commercialized, the way personal/private life should factor into economic decisions, etc. I guess that is why the word feedback jumped out at me; perhaps this is obvious, but the internet and data-driven commerce is reshaping the conditions of exchange in ways that ripple out into moral values (or alter the contours of subjectivity generally in a market-saturated society), and the process gains more momentum as it feeds on itself. It's not automatically bad (nor automatically good). But some reflexivity and feedback that can come from sustained critical attention seems like a good idea to counterbalance the uncritical embrace of the commercialized "social layer" that tech enthusiasts and business interests advocate. characterised by a one-way flow, from the relatively few in control of economic capital, symbolic capital and technical know-how, to the many who are entertained or who buy the products” and are thereby silenced. The internet is a "system of silencing" no less than it is a prompt for a cacophonous babble of data and information. The power inheres not simply in the ability to broadcast but in controlling the means of filtering, of aggregating, of implementing huge data sets and integrating their implications with other lines of business outside media. "Surveillance" is this context is basically another way of describing corporate data capture and attention brokering. Fuchs makes the point that users of Facebook, etc., "are double objects of commodification: they are commodities themselves, and through this commodification their consciousness becomes permanently exposed to commodity logic while they are online in the form of advertisements." I read that as getting at how online presence shapes self-consciousness, saturating us with awareness of the commercial potential of our activities. We become fatally aware of how we can sell ourselves, and thus intensify self-marketing practices. This leads to "self-surveillance" -- a grimmer way of describing online self-fashioning, or identity construction within social networks' interfaces. "frightening" growth of commodities that capitalism engenders -- recurrent problem for subjects within capitalism -- Marx's opening paragraph. Can't tell why I wrote this, but it fits with my general concern with "overload" and capitalist subjectivity. Have been preoccupied lately with this idea of the instability of capitalist subjectivity, the many ways in which the contradictions inherent in a particular moment in time in socioeconomic history reveal themselves in problems for the subject, who internalizes them, holds himself responsible, works to solve them psychologically. Under neoliberalism and an expanding regime of immaterial labor, we have this sense of profusion and exhaustion, of the "fun morality" and freedom as a kind of drowning in culture. 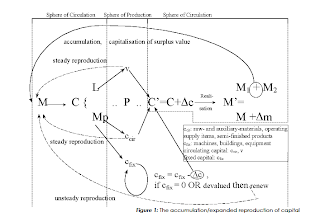 Not sure what work of Marx's I was referring to -- probably Capital Vol. 1. Think the solution for subjectivity being offered now comes through social media and its filtering mechanisms and its ability to make our lives coherent on the rationalistic principles of branding and self-promotion. At least its an ethos, in the face of the lived experience of entropic anomie. .
From Jean Baudrillard's The Consumer Society: Myths and Structures. Baudrillard argues for the productive function of consumption, which makes consuming more or less mandatory within the consumerist system. "The order of production does not `capture' the order of enjoyment (strictly speaking, such an idea is meaningless) for its own ends. It denies the order of enjoyment and supplants it, while reorganizing everything into a system of productive forces." I'm always arguing that social media (which capitalism ultimately needs more than we do) has made this dynamic more explicit and makes it harder for us to swallow the ideological alibis for consumption, which has more to do with producing status and signifiers than yielding direct personal satisfaction. In other words, consuming doesn't let us experience private pleasure, it binds us in a system of communication but forces us to speak of ourselves and identity as an alienated thing -- an object about which economic calculations are constantly being made. That is to say, consumerism allows capital to subsume the personal-identity-making process, creates "structural penury" at the experiential level. Because the system produces only for its own needs, it is all the readier systematically to hide behind the alibi of individual needs. Hence the gigantic growth of private consumption by comparison with public services (Galbraith). This is no accident. The cult of individual spontaneity and the naturalness of needs is, by its nature, father to the productivist option. Even the most `rational' needs (education, culture, health, transport, leisure), cut off from their real collective significance, are taken up, in the same way as the incidental needs deriving from growth, into the systematic future perspectives of that growth. There is no question for the consumer, for the modern citizen, of evading this enforced happiness and enjoyment, which is the equivalent in the new ethics of the traditional imperative to labour and produce. Modern man spends less and less of his life in production within work and more and more of it in the production and continual innovation of his own needs and well-being. He must constantly see to it that all his potentialities, all his consumer capacities are mobilized. If he forgets to do so, he will be gently and insistently reminded that he has no right not to be happy. It is not, then, true that he is passive. He is engaged in -- has to engage in -- continual activity. If not, he would run the risk of being content with what he has and becoming asocial. Hence the revival of a universal curiosity (a concept to be explored further) in respect of cookery, culture, science, religion, sexuality, etc. `Try Jesus!' runs an American slogan. You have to try everything, for consumerist man is haunted by the fear of `missing' something, some form of enjoyment or other. You never know whether a particular encounter, a particular experience (Christmas in the Canaries, eel in whisky, the Prado, LSD, Japanese-style love-making) will not elicit some `sensation'. It is no longer desire, or even `taste', or a specific inclination that are at stake, but a generalized curiosity, driven by a vague sense of unease -- it is the `fun morality' or the imperative to enjoy oneself, to exploit to the full one's potential for thrills, pleasure or gratification. Under the sway of Galbraith's ideas about administered capitalism, Baudrillard writes, "We may therefore predict that the heyday of the system of individualist values is just around the corner, that system whose centre of gravity is currently shifting from the individual entrepreneur and saver, those figureheads of competitive capitalism, to the individual consumer, broadening out at the same time to the totality of individuals -- keeping step in this regard with the extension of the techno-bureaucratic structures." I would adjust that slightly. I think consumption itself is increasingly viewed as entrepreneurial, and the self becomes a kind of small firm that one invests in through consumerist activities. Thus we become competing firms in the economic realm of "the industrial production of differences" as Baudrillard calls it -- the sytemic requirement to make new meanings for an economy capitalizing on sign values. As a result "personalization consists in a daily realignment to the smallest marginal difference, seeking out the little qualitative differences by which style and status are indicated." That is the dismal fate of self-actualization aspirations in consumerist culture; pettiness and Freud's narcissism of small differences.